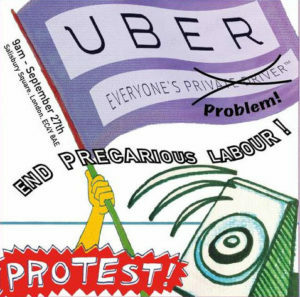 London Region UCU is supporting the precarious labour protest on Wednesday 27th September, the day of the Uber employment status appeal at the Employment Appeal Tribunal. The case against Uber brought by two trade unionists could have wide ranging consequences for all workers in the so-called gig economy. As the media spotlight will focus heavily on this trial, this protest is a way of turning some of that media interest to other precarious workers’ struggles happening now in the UK. We already expect cleaners, receptionists, security officers, couriers, Deliveroo riders, cinema workers and many more to be marching on the day. The UCU London Retired members banner will be there, please join us if you can. As much as this is a protest, it is also a carnival and a celebration of our unity as workers, so expect music, banners and dancing.